“Inequality has emerged as a major issue in the US and beyond. A generation ago it could reasonably have been asserted that the overall growth rate of the economy was the main influence on the growth in middle-class incomes and progress in reducing poverty. This is no longer a plausible claim. A new word is achieving ubiquity. The word has always been with us and at times has been a beacon to attract the friends of liberty and opportunity. But now I’m afraid it is beginning to be used as a justification for social and economic policies that will limit the expansion of both liberty and opportunity. The word? Inequality. More specifically, the word has become problematic when used in close proximity to the word income. There are those who believe that income inequality is the proximate cause of the Great Recession, if not the imminent demise of Western Civilization, pushing us into a dystopian world that will come to resemble the one depicted in the movie Blade Runner. This week we begin what will probably be a multi-week series on the subject of income inequality. Over the years, I’ve written many times about the lack of income growth for the middle class in the developed world. We have also looked at the growing spread between the top 1% or 5% or 10% and those further down the income scale. The widening spread is an undeniable fact. But what should be done about it? Do we take money from the more well-off, or do we increase opportunities for all? How do we increase opportunity without social expenditures for education and healthcare, and where will the money come from? What trade-offs do we get for the lost productivity and reduced savings that result from increased taxes? What institutional and policy barriers are there? These are all fundamentally important questions. What spurred me to start this series was a recent paper from two economists (one from the St. Louis Federal Reserve) who are utterly remarkable in their ability to combine more bad economic ideas and research techniques into one paper than anyone in recent memory. Their even more remarkable conclusion is that income inequality was the cause of the Great Recession and subsequent lackluster growth. “Redistributive tax policy” is suggested approvingly. If direct redistribution is not politically possible, then other methods should be tried, the authors say. So what is this notorious document? It’s “Inequality, the Great Recession, and Slow Recovery,” by Barry Z. Cynamon and Steven M. Fazzari. One could ask whether this is not just another bad economic paper among many. If so, why should we waste our time on it? And this week we’re actually not going to lay the paper out on the slab and dissect it; we’re just going to prepare for the post-mortem by getting up to speed on the issues it tries to address. The problem is that the subject of income inequality has now permeated the national dialogue not just in the United States but throughout the entire developed world. It will shape the coming political contests in the United States. How we describe income inequality and determine its proximate causes will define the boundaries of future economic and social policy. In discussing the multiple problems with the paper, we have the opportunity to think about how we should actually address income inequality. And hopefully we’ll steer away from simplistic answers that conveniently mesh with our political biases. I am pretty certain that by the end of the series I will have been able to offend nearly every reader, and some of you multiply. That’s OK – it means we’re thinking outside our boxes. I will admit to having been forced, of late, to change some of my more reflexively conservative positions with regard to the structural causes of income distribution trends and, even more importantly, the distribution of opportunity. It is the latter concept that should command our particular attention, and a fair distribution of opportunity should appeal to both libertarians (I more or less think of myself as one) and progressives. The unfair distribution of opportunity is not an injustice that can be redressed simply by composing erudite paeans to free markets or social justice, even though politicians will try. The problem is far more complex than that. Are we in fact, as Larry Summers suggests, on the road to a Downton Abbey economy – or, even worse, a Blade Runner-like dystopia? I should note that Professor Summers’ op-ed is a not entirely uneven discussion of the problem. “Given the widespread frustration with stagnant incomes, and an increasing body of evidence suggesting that the worst-off have few opportunities to improve their lot, demands for action are hardly unreasonable. The challenge is knowing what to do.” We will address Summers’ conclusions later in this series, but for now let’s think about how to approach the challenge of income inequality. Of the underlying or related searches, income inequality is the most frequently searched term. It spiked to all-time highs after President Obama’s State of the Union address in January. We have to take this data with a grain of salt, but it clearly shows that inequality is becoming a more popular search term. And if it is becoming a more popular search, that is clearly because people are thinking and talking about it a lot more. And if people are thinking and talking about the subject of income inequality a lot more, then my readers, who are by and large thought leaders in their respective worlds, have a serious responsbility to inform that discussion. The fact that incomes of various segments of our society are diverging is not really disputable. There are many ways to sort for the reasons for income differentials, but one of the ways is by education level, where the income differences have become rather stark over the last 40 years. Note in the chart below that incomes for all segments of the population generally rose in tandem up until the beginning of the Information Age in the early ’70s, and then the disparity began to grow. Those with more education saw their incomes increase while those with less education saw their incomes fall. 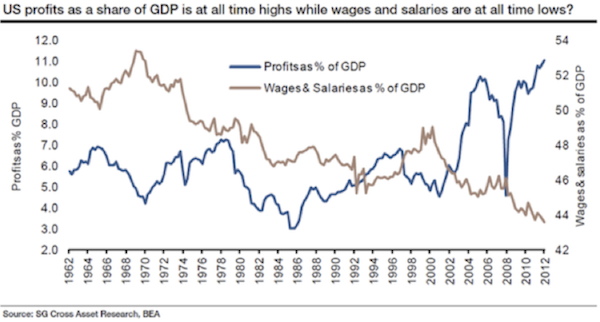 As Summers noted, a rising share of GDP is going to profits as opposed to wages. This is a trend that started at the beginning of the last decade. One other odd bit of information that I came across while researching this topic is that between 1979 and 2002 the frequency of long work hours (more than 50 hours a week) increased by 14.4 percent among the top quintile of wage earners but fell by 6.7 percent for the lowest quintile. And those extra hours translate into extra income. (You can see the NBER study here.) I don’t know about you, but my hours have significantly increased since 2002. Not sure that is relevant, but just saying. Let’s take a somewhat philosophical and less databased approach to income inequality. Mainstream economists and policy makers are still thinking of inequality through the lens of 19th and early 20th century experience, when robber barons like Carnegie, Rockefeller, and Vanderbilt supposedly lined their pockets by withholding reasonable wages from the working poor. The share of income going to the top 1 percent of earners has increased sharply. A rising share of output is going to profits. Real wages are stagnant. Family incomes have not risen as fast as productivity. The cumulative effect of all these developments is that the US may well be on the way to becoming a Downton Abbey economy. That thinking assumes that if income inequality is rising, the top 1% is getting richer at the expense of the working class, because it assumes production still heavily exploits the relatively unskilled labor that most Americans can provide through hard work. It does not discriminate between value-added labor and value-added information and innovation. As I argued three weeks ago, the gains from the Information Age have been unevenly distributed throughout the economy. This is a structural problem in the sense that the productivity gains from the first two Industrial Revolutions are essentially thoroughly distributed through the economy. All workers saw their incomes increase along with increasing productivity for the 200 years of the Industrial Revolutions. Yes, entrepreneurs, innovators, and knowledge workers saw their incomes rise faster, but a rising tide of productivity lifted all boats. The same phenomenon is playing out now in developing markets, where much of the basic infrastructure of industrial revolution is still being built. I would expect that the same income inequality issues would develop in those markets in conjunction with the full rollout of industrial revolution and the shift to a knowledge-based economy. Another observation that I did not make three weeks ago but have subsequently come to embrace is that knowledge workers have indeed seen their incomes increase because of their ability to put their knowledge to work more productively. Goods-producing workers have by and large not seen much rising productivity in the last 30 years due solely to their work and thus have not seen an increase in their incomes. 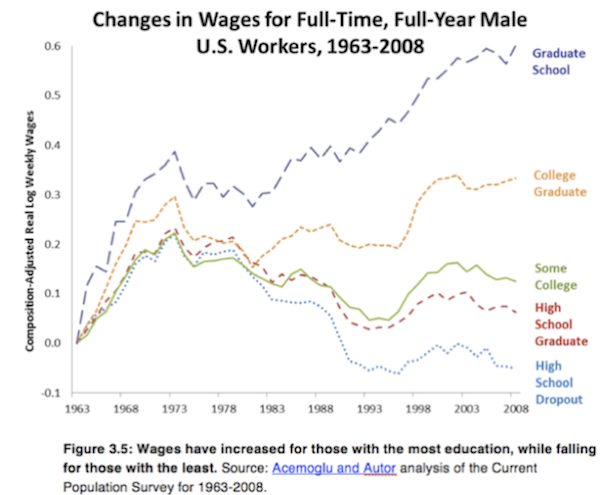 To the extent that workers have skills, their incomes rise. That being said, the top 1% is getting richer either by (1) allocating capital to the right places (which all right-thinking people want to see happen), or (2) by employing skills that most of the American work force does not have – because production increasingly depends on the hard work of creative workers with hard-earned skills gained through education and experience. Today, a much smaller percentage of our labor force is responsible for a much greater percentage of economic output. Their wages are rising because their productivity is rising. The trouble with conventional wisdom about income inequality is that it is so fails to factor in productivity and the sources of productivity. While populist politicians, mainstream economists, and envious market watchers would like to brand billionaire inventors like Tesla CEO and PayPal Founder Elon Musk, Facebook CEO Mark Zuckerberg, or eBay cofounder Pierre Omidyar as modern-day robber barons, they haven’t really robbed anyone. The emerging class of billionaires is creating value that did not exist before they arrived, and they’re doing it with relatively small teams of highly skilled knowledge workers. And they deserve every penny they earn. On the flip side, a growing majority of our labor force is responsible for a much smaller percentage of economic output. Their wages are stagnant because more people are competing for a shrinking number of jobs. I have brought to your attention before a very important book by Mark Buchanan called Ubiquity, Why Catastrophes Happen. I HIGHLY recommend it to those of you who, like me, are trying to understand the complexity of the markets. It’s not directly about investing, although he touches on that subject. Rather, it’s about chaos theory, complexity theory, and critical states. It is written in a manner any thoughtful layman can understand. There are no equations, just easy-to-grasp, well-written stories and analogies. There are many subtleties and twists in the story ... but the basic message, roughly speaking, is simple: The peculiar and exceptionally unstable organization of the critical state does indeed seem to be ubiquitous in our world. Researchers in the past few years have found its mathematical fingerprints in the workings of all the upheavals I've mentioned so far [earthquakes, eco-disasters, market crashes], as well as in the spreading of epidemics, the flaring of traffic jams, the patterns by which instructions trickle down from managers to workers in the office, and in many other things. At the heart of our story, then, lies the discovery that networks of things of all kinds – atoms, molecules, species, people, and even ideas – have a marked tendency to organize themselves along similar lines. On the basis of this insight, scientists are finally beginning to fathom what lies behind tumultuous events of all sorts, and to see patterns at work where they have never seen them before. Now, let's think about this for a moment. I’ve written about the sand pile game where researchers created a computer simulation of the sand piles that we built as kids at the beach. In their simulation of the sand pile, they found that as the number of grains of sand involved in an avalanche doubled, the likelihood of an avalanche was reduced by 2.14 times. We find something similar with earthquakes. In terms of energy, the data indicate that earthquakes become four times less likely each time the energy they release is doubled. Mathematicians refer to this as a “power law,” a special mathematical pattern that stands out in contrast to the overall complexity of the earthquake process. As I noted a few weeks ago in Outside the Box, we are indisputably living through the greatest era in human history. Humanity is immeasurably richer than it was 100 or 50 or even 20 years ago. And along with everyone getting richer, we’ve seen a rising number of super-rich. But as the Huffington Post noted a few weeks ago, even the super-rich are getting left behind by the uber-rich. Eighty-five people have as much money as do the poorest 3.5 billion. The top 1% have almost half the liquid wealth that has been accumulated in the world. There are 1,426 known billionaires, and gods know how many additional kleptocrats and people who have managed to maintain some semblance of privacy. Thought experiment: if world GDP grows at 3% compounded for the next 100 years, world gross domestic product will be 16 times greater than it is today. That’s simple math. But if the future is anything like the past, the distribution of that enormous increase will not be even throughout the population. Not everybody will be 16 times richer, and some people will be fabulously richer. Unbelievably richer. Off-the-charts and mind-bendingly richer. Someday, and with the real possibility of its happening in our lifetimes, we will see the world’s first trillionaire. This week we awakened to the fascinating story of WhatsApp cofounder Jan Koum selling his company to yet another of the elitist uber-rich, Mark Zuckerberg, founder of Facebook. Theoretically, the 37-year-old Koum walks away with about $6.9 billion – after starting out as a refugee from Kiev some 20 years ago, living on food stamps. He created this fabulous wealth with a partner and less than 70 employees in just a few years on the strength of an idea, a lot of chutzpah, and venture capital from the very firm that Zuckerberg spurned less than 10 years ago (Sequoia Capital – and that in itself is a great side story you can learn about on Google). Of course that is not yet $1 trillion, but that is not how we get to the world’s first trillionaire. Many of the young men and women who are billionaires today are going to be living to the end of this century. What if a few of them are able to compound their wealth at 6%, 8%, or even 10% a year? Below is a chart of what Jan Koum might see his wealth become if he were inclined to continue the chase. Zoum has almost as much net worth today as Elon Musk, founder of PayPal and Tesla Motors ($10 billion). As noted above, there may be as many as 2,000 billionaires in the world, with more being created every day. I can think of half a dozen ideas that could generate more than $10 billion for their creators. A cure for cancer could easily be worth $100 billion. A new, clean, localized energy source could create multiples of that. There are already five family groups with over $50 billion each. At 6% compound returns they could top $1 trillion within 50 years, although several are giving away most of their wealth. Income inequality is not going away. Visually, and given the realities of the unfolding Age of Transformation, we may even see greater disparities. What else can we expect as long as we continue to rely on a 20th century education system to equip 21st century workers? When we allow crony capitalism to create an unequal playing field with special benefits for some? When businesses successfully lobby to create barriers to entry for future competition so that they can maintain their profits without having to compete? When we give tax benefits that help a relative few so that we are forced to tax those who are productive at ever higher rates? Instead of obsessing over the rising income inequality that has always accompanied great periods of innovation (it took decades for the first and second Industrial Revolutions to be reflected in productivity numbers as well as overall wages), Larry Summers, Paul Krugman, and other “big league” mainstream economists should be advising President Obama, the House, the Senate, and every voter who will listen about the importance of aggressive reforms in education, entitlements, and tax/regulatory policy. They should be asking why knowledge workers are moving ahead, while more of the labor force is left behind. And they should be formulating policies that can empower and encourage more unskilled workers (or workers with outdated skills) to become highly skilled knowledge workers in the coming decades. But such questions don’t suit their political agendas. These are not questions with easy answers. They demand hard work not only on the part of politicians, but also from the people wanting the benefits. The Age of Transformation will require constant education and updating of skills. There is no way for a government to protect its citizens from increasingly accelerating change without ultimately destroying the benefits delivered by that change. The focus has to become on how to help people adapt and prosper in an environment of unremitting change. What sort of government and what economic policies will foster an environment that increases productivity and income for everyone? Next week we will in fact get to the actual economic paper which kick-started me into this line of thinking, and we’ll also look at a remarkable study which shows that income mobility in the United States is still roughly where it was 40 years ago. As I will point out, that’s not good enough. Many countries (such as Denmark) do much better, and perhaps we should learn why and how. We will learn that trying to stimulate demand may not be the best monetary policy, and in fact it may be producing the actual environment in which income inequality is increasing. Ideas have consequences, and bad ideas typically have bad consequences. But all that’s for next week. I'm enjoying my longer than usual respite from travel, but tomorrow I will see my schedule pick up aggressively. I will be in Houston tomorrow night, then back home for a day before I go to Los Angeles, then fly cross-country to Miami for a speech for my friend and partner Darrell Cain. Then we’ll enjoy a fabulous Saturday evening soirée on the beach, when Patrick Cox, editor of Transformational Technology Alert, will come over from the West Coast of Florida for the evening to join us. From Argentina I’ll fly more or less directly to South Africa for a week. I’ll spend the first few days at a game resort and then jump into a speaking tour that will take me to Cape Town, Durban, and Johannesburg at the behest of Glacier by Sanlam, a very-full-service financial firm. I am looking forward to that trip. After that, I am home for a little over two weeks before I head out to Brussels and Geneva (and perhaps another European city or two) and then head back home to prepare for my Strategic Investment Conference in San Diego, May 13-16. This is a fabulous conference, and you really should make plans to attend. One of the people I will be meeting in DC is my old friend George Gilder. I was talking to him yesterday about schedules, and he noted that he came really close to not being able to … stay on schedule. It seems he was involved the day before in a head-on collision that totally destroyed both cars, but everyone in the cars walked away due to air bags and the marvelous collapsing design of recent-vintage cars. I am grateful for that new technology, because we need minds like George Gilder around for a lot longer to help us think about how to deal with the age of accelerating change. Not to mention that I would miss him personally. DC is shaping up to be an interesting few days, and I will report back to you. It is time to hit the send button. I really do have to get a better handle on the timing of my trips. I will be leaving Dallas when the weather is perfect but have nothing scheduled for August when 100° days are typical. But then that is why God invented air conditioning. Have a great week! March 12, 2014, 5:07 p.m.
A good and provocative article. But one must qualify it with better data, as pointed out below by K Delay. There is income stagnation in some areas of the US economy, but it’s not as pervasive as some make it out to be. Total compensation is increasingly warped by rising health care costs, which slows the growth of take-home pay. That said, the slope of that Paretian power law of wealth distribution has steepened in the last forty years, especially in the last twenty. There’s little doubt of the cause: increasingly and recklessly easy monetary policy. It inflates prices of the assets of those who already own the bulk of assets. The effect is at least exponential, not linear. I write here of *wealth* inequality, not income inequality—again, the two are frequently confused. There is a relationship between the two, but growing income inequality is a broad social phenomenon, while wealth inequality is a mainly a tale of the top reaches of the pyramid. These two, often confused, are in turn confused with a third thing, the growth of corporate earnings as a proportion of GDP. While this tendency has become more extreme in the last decade or so, its origins reach back to the 1960s and the arrival of large-scale automation in the US economy. The monetary ease of the last generation has made the trend more extreme, by artificially lowering corporate funding costs. But most CFOs are not fooled (at least, they aren’t any more): corporate cash is not flowing heavily into hiring or cap-ex, but into M&A, dividends, and share buybacks, a sure sign that productive use of capital has taken a back seat to other trends. But as pointed out below by qbarker, productivity growth has outpaced profit growth for most of the post-war period. Much of its benefit accrues to consumers, not capital. Maybe it really is all due to the abandonment of hard money on that fateful August 15th of 1971, as alleged below by Jack Goldman. Certainly, the disappearance of an objective standard of value means that value can be “gamed” by the well-connected and smooth-talking in ways never before possible. As for revolutions and Bastille-storming, as far as the developed world goes, not likely. Aging populations don’t storm anything. Such events, like the “Arab spring,” are enabled by very young-skewed demographics. The fate of the developed world, while it might include episodes of inflation, in much more likely to be deflationary, in many senses of that word. March 5, 2014, 2:03 p.m.
Feb. 28, 2014, 3:26 p.m.
That said, the “power” of the “power law” is not necessarily a constant, and it’s generally a function of political, economic and historical forces with those in power trying to maximize their own benefits. For example, privileging capital gains and carried interest over other income has had a massive impact on the compounding of wealth and income, and increasing inequality, over recent decades, particularly among our mutual friends in the HF industry, as do inheritance taxes/laws (or lack thereof), which were the primary mechanisms of dynastic wealth in pre-modern societies and today. I’d venture to guess that most of Mauldin’s readers, including this one, have benefited from these policies, but this brings us into the dark realms of politics and ideologies. As in other areas where power laws apply, we tend to think things are more or less “normally” distributed, and we’d prefer that the distribution would have less skew and kurtosis (ie: “tail risk”), but, unbeknownst to almost all, wealth and income follow a power law distribution with exponential extremes of both wealth and poverty that can be profoundly impacted at a structural level by political decisions. It would seem that this “gap” between perception and reality can be arbitraged by those with an interest in maximizing the “power” of the power law or those in the wealthiest Metro area in the country (DC, by a wide margin over SF and NY) or by ideologies posing as economics. Just saying…. On a related note, tech companies, particularly those with network effects, tend to be natural monopolies, and market share tends to follow a very steep power law distribution with a small initial advantage (ie: path dependency) often determining the winners from the thousands of losers we never hear about. Many other industries, like banking and hedge funds for example, also tend to follow power law distributions that can get more concentrated over time, often with economic power being translated into political power in a feedback loop. It was said during the financial crisis that the big banks were “too connected to fail,” but that might also apply to those along the Acela corridor with fiber optic cables from DC to Silicon Valley. Many of these outcomes may be explained by a combination of Talebian randomness and path dependence, topics you’ve discussed in the past, with small initial advantages leading to massive final gains as you scale the power law ladder. Malcolm Gladwell’s “Outliers” is also interesting, if not scientifically rigorous, here. For example, if you look at the HF industry, most of the Titans on the Altegris Platform had a first mover advantage starting in the 90s and by dint of early successes, when arbitrage was like shooting fish in a barrel, and long-term survival, notwithstanding a 56% drawdown in 2008 in at least one case, they are billionaires. Taking things a step back, most attended elite Ivy Leagues and/or Prep Schools and went through elite investment bank training programs or had otherwise privileged access to the Canyons of Park Avenue and Greenwich Country Day Schools and Clubs. It may just be coincidence, but not many women or minorities among the HF/finance elites. I could go on, but, given the relative lack of socio-economic mobility in our society, it would seem that path dependency applies along the entire power law distribution and the “outliers” are the ones who make it out. Given the distribution of white males with above average/high intelligence at the top of the pyramid, it would seem that initial conditions are crucial in climbing the power law ladder, with some starting on 2nd or 3rd base and others scalping tickets outside the stadium. You and I made it past the “velvet rope” with a lot of hard work from relatively humble beginnings. Others, not so much. It would seem that the fundamental political and economic problem of our times is how do we leverage the Promethean forces of capitalism and the creative energy of the American people, while opening the doors to opportunity to those not part of the capitalist/financial elite or the knowledge workers and technocrats who serve them in our Breaking Bad/Downton Abbey/House of Cards economy and political system. As you’ve repeatedly pointed out over the years, we’ve reached the Endgame of the Debt Supercycle and Code Red Monetary Policies, which have disproportionately benefited those on the top rungs of the power law distribution through increasing debt and financial engineering, while much of the real economy, outside a few pockets, continues to stagnate. Feb. 28, 2014, 10:15 a.m. Interesting you should bring up demand as an important subject. For what better representation of value than demand? A command of value is tricky. Replace value with demand and the value concepts begin to make sense. Feb. 24, 2014, 7:47 p.m.
Alan Reynolds also has written many other papers on this subject. As you can see if you take a look, much of the hysteria about “income inequality” comes from incomplete data studies. This is not to say that there is no stagnation on some levels of our economy. But until we get the analysis right, we can’t really draw any conclusions about the source of the problem, in my opinion. What is my hypothesis regarding the origins of any stagnation we are observing in reality? Too much government and Fed intervention over the past thirty years, which has stifled real growth in economic development and hence wages, and which, e.g., has done huge damage to the employer/employee relationship through picking winners, government hand-outs, immigration confusion, and incentivizing our youths’ attendance in useless and now very overpriced college programs through the enormously distorted and distorting student loan programs. Feb. 24, 2014, 6:43 p.m. This was all predictable on August 15th, 1971. Counterfeiting currency separates the classes. The wealthy, English, Jewish, college graduates, bankers, government, become ultra wealthy by counterfeiting. Dow was 750 silver dollars in 1964 and is STILL 750 silver dollars fifty years later in 2014. Dow was $750 paper dollars in 1964. Dow is now $16,000 in counterfeit currency. It’s that simple. End of story. The rich have had their assets inflated. Corporations and government win big. Families, employees, renters, and children lose. There is really nothing more to understand. Winners, the rich, love counterfeiting. Losers, the poor, are destroyed as assets inflate out of their reach. In buying power, the middle class has been sacrificed, women put to work, to subsidize the elites. It’s all based on counterfeiting. No progress in fifty years in real silver money. Get it? Feb. 24, 2014, 4:11 p.m.
Lots of great restaurants in NY and I’d love to meet you sometime. Feb. 24, 2014, 10:58 a.m. I commend John for writing what is sure to be a sequence of posts about income/wealth inequality. He seems to be at the beginning of his research into this. With that in mind, here are a few pointers to some of the information that I have read/watched over the last few years on this topic. 1. Although John and most of his readers may not be a fan of Robert Reich, I found his recent documentary “Inequality for All” (available for rent from the usual sources: iTunes, Amazon, Netflix, etc.) interesting. It is worth watching, even if you disagree that income/wealth inequality is a problem. 2. I am looking forward to the Thomas Piketty book (“Capital in the Twenty-First Century”), which also covers this subject, with implications on the future. The release of the hardcover version is imminent. I got interested in this book after reading this guest OpEd review in the NYtimes a month ago: http://www.nytimes.com/2014/01/29/opinion/capitalism-vs-democracy.html. But you don’t have to wait for the book, you can download a Piketty presentation that he plans to give next month here: http://piketty.pse.ens.fr/files/Piketty2014OECDGrowthDialogue.pdf - Regardless of your views, you will find the graphs fascinating. 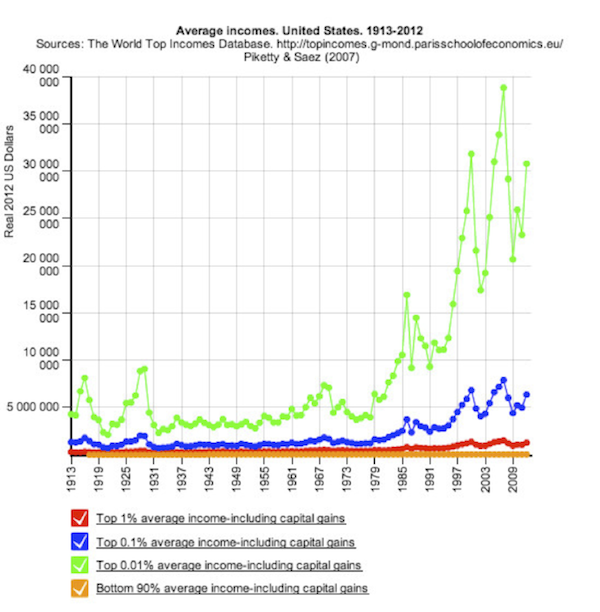 Note: John may be aware of Piketty’s work, since he used one of his graphs (“Average Incomes, United States, 1913-2012”). 3. Why does Income/Wealth Inequality matter? About 2 years ago, I watched this 17min Ted Talk by Richard Wilkinson: http://www.ted.com/talks/richard_wilkinson.html. For a more recent, but longer talk, http://www.youtube.com/watch?v=sLdf72KNYLo (“WRR-Lecture 2013 - Richard Wilkinson - The Social Impact of Inequality”). Feb. 24, 2014, 10:35 a.m. 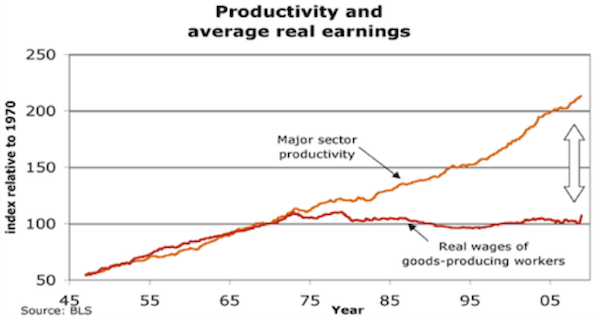 True, profits and productivity are both outpacing wages, but overlay those two graphs and you’ll see productivity is dramatically outpacing profits. The difference is going to customers through lower prices, driven in part by globalization’s deflationary forces. This dovetails with income inequality—globalization forces businesses to do more with less, valuing employees who can raise a firm’s competitiveness more highly; those who cannot are increasingly disenfranchised and difficult to employ. The result is two offsetting impacts of the same catalyst: globalization makes some employees more valuable and some less, pressuring middle-skilled incomes and widening inequality. But at the same time it mitigates the damage by delivering lower consumer prices to those it disenfranchises. The disconnect between productivity and wages appears to have occurred as we left the gold standard. Coincidence, or does an elastic currency (which erodes domestic purchasing power and fosters currency devaluations as a means of foreign competition) conspire against middle class employability and living standards? Feb. 24, 2014, 9:34 a.m.
Wages and salaries as a share of GDP in the chart above is actually „wage disbursements“ in BEA Table 2.1. Total labor cost to business is „compensation of employees“ which fell „only“ by 5.1% as a share of GDP since 1969. National Income as a share of GDP fell by 2.3% since then. Since „normal“ profit is made as a share of revenue=GDP, this reduction in National Income could not accrue to profits (whithout dragging business activity down). Taking this into account total compensation has been reduced „only“ by 2.8% since its top.